“Visceral, raw and compelling.” That’s what C. J. Box had to say about it and I must agree. I’m thinking…kind of like lemon juice in a paper cut. But, not in a bad way. Rice Moore has taken a position as a caretaker for a remote Virginia forest preserve. Yes, he is also hiding out from the Mexican drug cartel whose Sicario he offed once he got out of jail, which is why he keeps telling people his name is Rick Morton. He was an actual field biologist before he got sucked into the drug trafficking trade, so, this job suits him well. His days are spent working on the property and recording phenology for the years-long ongoing log. All seems to be going well until it comes to his attention that bears are being poached off the preserve. Can’t have that! 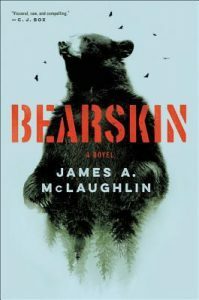 The story of his battle with the bear poachers and his memories of his days in the Arizona desert doing errands for the drug cartel with his lover makes for a wild and page-turning read! McLaughlin is a skilled practitioner of the written word. The landscapes, both mountain and desert, are alive and feel very real. The characters are believable and seem very much of their place. The mental fugues Rice sometimes finds himself in are…perplexing but fascinating, especially when he spends such a long stretch of time on the mountain that he, well, pretty much becomes the mountain. This would not be for everyone. It is, no question, a dark and violent read. It was, for me, one of those titles you both race through, because you MUST know what is going to happen, and, on the other hand, wish would never end, because it makes for such satisfying reading. PreviousPrevious post:Lifelong Learning … in your jammies!NextNext post:Consult the Wiz Kidz!